With its outstanding field and road performance, the TM800 has been developed for high power tractors. TM800, one of the most successful product of our agricultural radial range, is D rated, able to reach 65 km/h on the road at the nominal pressure of 1.6 bar. 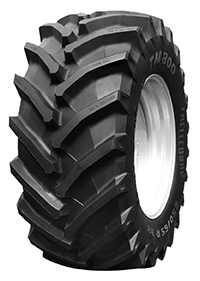 TM800 with its extra-large tread pattern offers maximum performance in the field and it is able to carry heavy loads and to work at very low pressure. Its winning feature is its excellent performance on the road in term of stability, handling, comfort and long tire life. The wider surface guarantees low soil compaction improving farm productivity and crop yields. The footprint area of TM800 tyre is larger, both at 1.6 bar and at 0.6 bar versus premium brand competitor tire.